It would seem that as we strive to show mercy, compassion and kindness to every living soul there are exceptions. There are times when kindness is not what's needed and tough medicine is just what the doctor ordered. James W. Loewen's book Lies My Teacher Told Me: Everything Your American History Textbook Got Wrong dispenses just this kind of medicine through 362 pages of thought provoking prose. Loewen's book is based upon a critical analysis of several history textbooks that are currently being used in our nation's schools. 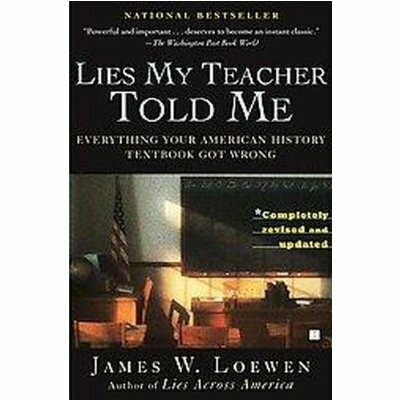 While the numerous "lies" that Loewen identifies are fascinating and at times mind-blowing, what I found most interesting is his discussion of why the "lies" are being told and the implications of lying to our young people about the past. Loewen begins with a chapter dedicated to the process of "heroification". He describes "heroification" as "a degenerative process (much like calcification) that makes people over into heroes. Through this process, our educational media turn flesh-and-blood individuals into pious, perfect creatures without conflicts, pain, credibility, or human interest" (pg. 11). The ultimate goal of this process, which serves as an organizing principle of history textbooks is not to tell the truth but to make the reader (really White readers) feel good about the country and by extension, himself or herself. It is history taught as a kind of nationalist- psychotherapuetic-propaganda. Along these lines, history textbooks also engage in vilification of historic figures. Loewen's discussion of the vilification of abolitionist John Brown is a must read. Ironically, Loewen argues that teaching history this way actually contributes to history being the least favorite subject (even among affluent White students) and makes students "stupid". Not only do students arrive at college burdened with misinformation about the past, they have not learned to understand how and why things happened the way they did and their relationship to the present. One of the most interesting chapters actually focuses on how history textbooks do a poor job of teaching about the recent past. A final strength of the book is that it allows us a peak behind the curtain at the business and politics of how these textbooks are written and "adopted" for use in our schools. I found these portions of the book to be even more disturbing than the "lies" that ultimately result! On a positive note, Loewen shows that there has been improvement in some areas, and there are textbooks that do a better job with particular subjects than others. This offers hope that things can change. We do not have to continue to teach history this way. If Americans want to achieve "progress and success", if we want our nation to be distinguished by "divine qualities", we have to be truthful about our past. We have to stop lying to our children and to each other. Loewen has offered a powerful tool to do just that. I hope that you will read it and encourage others to do so.